I have terrible news. The barn owl babies are all dead. I don't know what happened, I can't quite piece this together in a way that makes sense, but I'll tell you what I know. Yesterday morning nothing was amiss. I did not go back out until it was time to feed the horses around 5pm. 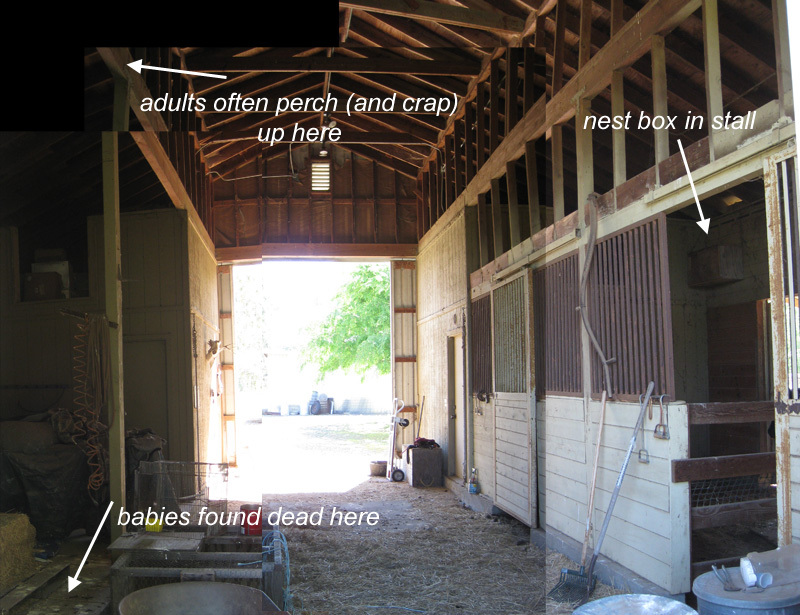 At that point, I found three dead owl babies on the floor of the barn. They were not near the nest box, they were on the opposite side of the barn on the cement slab where most of the owl droppings and pellets are (the adults perch up there on a beam). It appeared that they had been dropped from that location onto the cement. The youngest was certainly not more than a day or two old, and the others a few days older. Aside from being dead, they appeared to have been in good shape. Fat bellies, not a mark on them except the littlest one had two (that I saw) puncture marks on the body. I don't know whether they had died (got chilled overnight? ate poisoned rodent?) and were removed by the adults, or whether the nest was raided and the babies were killed. Considering the stack of dead rodents that was in the nest box, they aren't exactly fastidious house-keepers. I really can't imagine the adults removing dead nestlings, and from the looks of them they had not been dead long when I found them. It's just the location where they were dropped that makes the adult owls somewhat suspect. If the nest was raided and they were taken by another bird, why did they show no sign of trauma on their bodies? And why were they carried across the aisle and dropped, rather than killed and dropped near the box itself? Who would raid the nest? An internet search led to research showing that Great Horned Owls are known to that. Well, we do have them here. I rarely hear them, and haven't for quite some time, but they are around. There is a pair of kestrels nesting about 30 feet away from the barn, but they are such timid little things I can't imagine them doing anything, and they've shown no sign of aggression toward the owls. I have seen Red-Shouldered Hawks chase the owls outside the barn. Could they have done it? It had to have been a bird of some sort. No other animal can get to the box (except me with a ladder). The only birds I see in the barn other than the owls are sparrows, starlings, and the occasional scrub jay. I have not seen the adults for the last two days. There was a dead gopher dropped in the barn this morning, so I know they'd been around, and I heard them tonight. I have no idea if they will re-nest. On one hand I sure hope they do, but on the other I'm worried that whatever happened with happen again. Pardon the badly stitched panorama, but this the where things happened, and it doesn't make sense to me. I think it was your killer sparrow, the one that torments the swallows on your front porch. Someone commented on my LiveJournal blog that they seem to remember learning that young/inexperienced owl parents may get overwhelmed or confused and kill their babies, and that's something I've been wondering about. Like the time when I was 5 years old and my brand new hamster had babies... and promptly ate them all. If it wasn't for the location where they were dropped, I wouldn't suspect the parents at all, but that's where they drop everything, so I'm still tempted to blame them. I am trying to trap those stupid sparrows though, the swallow is nesting. That is SO sad! I hope the parents do try again. I am catching up on your posts, and OMG, that is so sad, I would be upset as well, espeically after you just discovered the little babies! Ugggg.